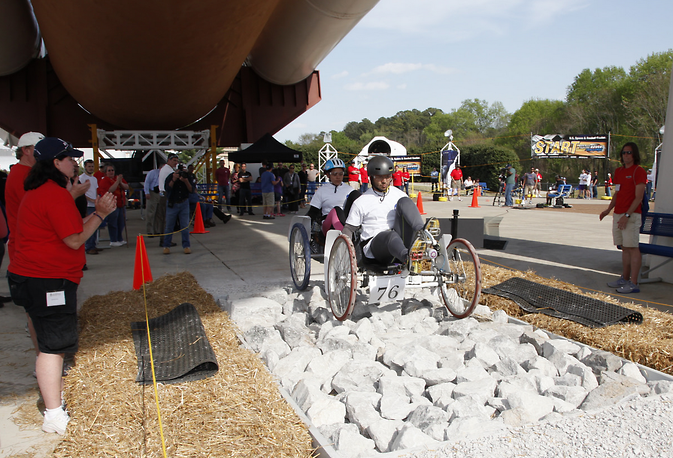 The annual NASA Human Exploration Rover Challenge will take place April 17-18 at the U.S. Space & Rocket Center in Huntsville, Alabama. NASA Television will provide coverage of both days’ races from 8:30 a.m. to 6 p.m. EDT. NASA Marshall Space Flight Center’s UStream channel will broadcast the races and the awards ceremony, which will take place at 5 p.m. CDT on April 18 in the Davidson Center for Space Exploration in Huntsville. This year’s competition will feature more than 80 high school and college teams from 18 states, Puerto Rico and international teams from Germany, India, Mexico and Russia racing against the clock in this engineering design competition. The Rover Challenge requires students to design, construct, test and race human-powered rovers through an obstacle course simulating the terrain potentially found on distant planets, asteroids or moons. Teams race to finish the three-quarter-mile-long obstacle course in the fastest time, vying for prizes in various divisions. The event concludes with a ceremony where corporate sponsors will present awards for best design, rookie team and other accomplishments. Hosted by Marshall, the Rover Challenge highlights NASA’s goals for deep-space exploration. The challenge is inspired by the Lunar Roving Vehicles of the Apollo moon missions. The competition challenges students to solve engineering problems, while highlighting NASA's commitment to inspiring new generations of scientists, engineers and explorers. Media interested in attending should contact Angela Storey of the Marshall Public and Employee Communications Office at 256-544-0034 no later than 4 p.m., April 15. Visitor parking is available in front of the Davidson Center.